There must be something magical about the combination of legendary guitarist, Carlos Santana, and record company wonder man, Clive Davis. In 1969, Davis signed Santana: a young band with a multi-cultural sound unlike any that had gone before them. 30 years later, Davis signed Santana again, this time to produce Supernatural: an album that not only revived Santana's career, but boosted his commercial success to previously unreached heights. Supernatural set, broke or tied so many records that it's hard to believe its centerpoint was a 52-year-old guitar player with a 30-year career behind him. So daunting was Supernatural's success at the Grammy awards that year that veteran singer/songwriter Sheryl Crow, during her acceptance speech for the Female Rock Vocal award, remarked that she wanted to "thank Carlos for not being in this category." Second are the monumental sales numbers. Supernatural has sold more than 25 million copies so far, and spent a combined total of more than 11 weeks as the number one selling album on the Billboard charts. Two singles from Supernatural, "Smooth," featuring Rob Thomas, and "Maria Maria," produced by Wyclef Jean and Jimmy Duplessis, together spent nearly five months at the top of the charts (12 weeks for Smooth, and 10 weeks for Maria Maria). 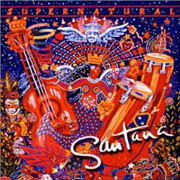 Last, but certainly not least, is what the unbridled success of Supernatural has done for the career of Carlos Santana. It's amazing to think that the year before the release of Supernatural, Santana, while being known to musicians, hard-core fans, and many baby boomers, was certainly not a household name. Most people would grin when "Black Magic Woman" or "Evil Ways" came on their classic rock radio station, but that was probably the extent of their awareness. So, how did this all happen? Much of it comes down to chemistry: between Santana and his co-writers and producers, between Carlos and his music, and between the guitar icon and the record company legend. It is with the relationship between Carlos Santana and Clive Davis that the birth of Supernatural started. Before the album even begin, Carlos had been to five record companies -- all of whom had turned him away, dismissing him as a relic whose drawing power was dimmed. It's poetic justice then, that Clive Davis, who was struggling to keep his own job, agreed to see Santana. Even more credit must be given Davis for being able to translate the sometimes inscrutable words of Carlos: During the fateful meeting with Clive Davis, Carlos told him that "'I want to reconnect the molecules with the light, man, you know?'" "What he means when he says 'connect the molecules to the light' is in essence that he wanted a radio-friendly album," Davis explains. "There's something about Carlos when he talks like that, and it's natural," Davis says. "He has the essence of dignity, the essence of grace and spirituality . . . So that although he'll talk about the molecules and the light, he'll talk also in very sensual terms about his music." Next: Santana Featuring . . .